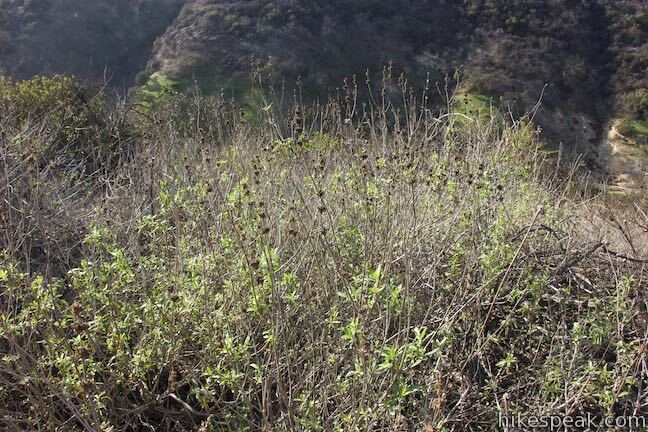 The Santa Monica Mountains have significant parks with great hiking getaways. 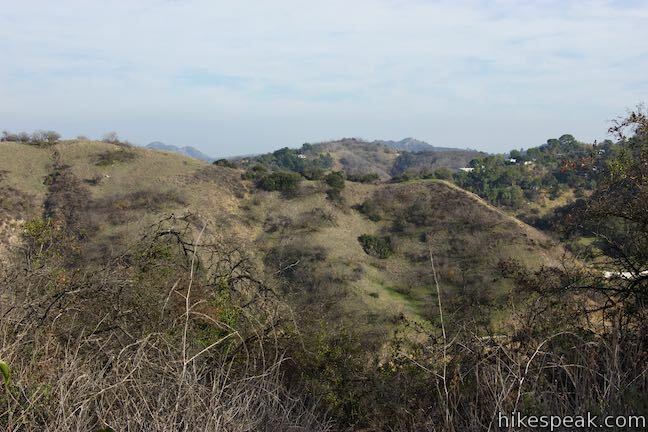 Often overlooked are smaller undeveloped pockets within the mountains that offer quick escapes from the stresses of Los Angeles. 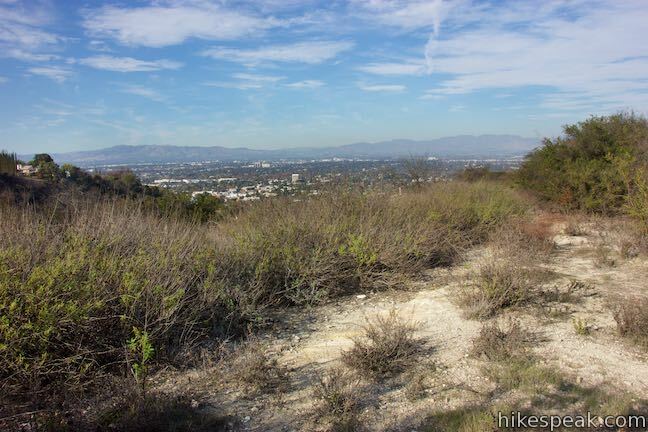 Longridge Park in Sherman Oaks is the latter, a 50-acre park with a 0.2-mile long use-trail. 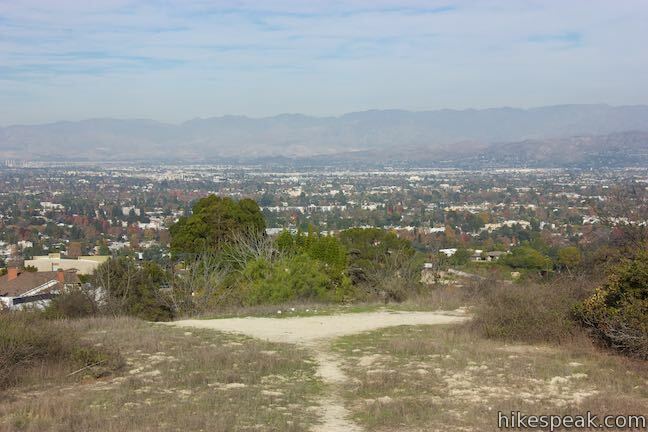 Longridge Trail has ridge-top views throughout its short run, like perspectives north across the San Fernando Valley and east toward the Griffith Park end of the range. 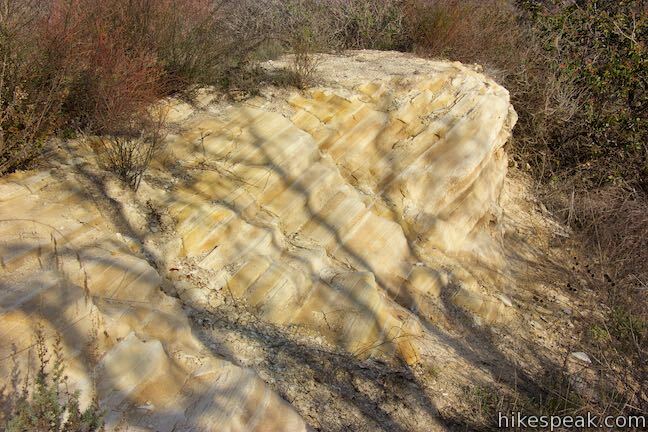 Another trail highlight is an outcropping of sandstone with striped layers. 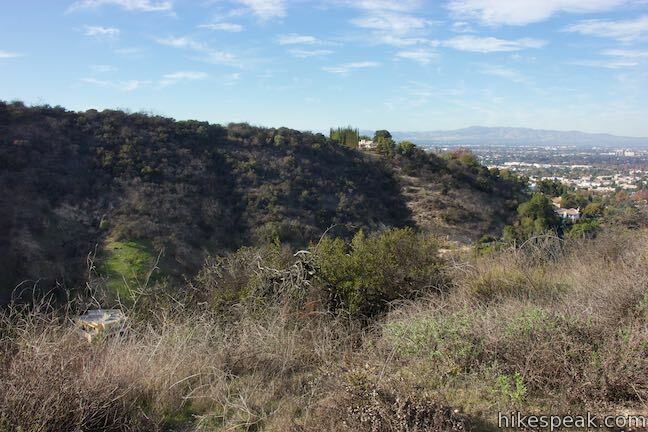 You won’t burn a lot of calories on this 0.4-mile round trip hike with 75 feet of elevation change. However, if you’re satisfied with short and sweet, Longridge Park is plenty fun. 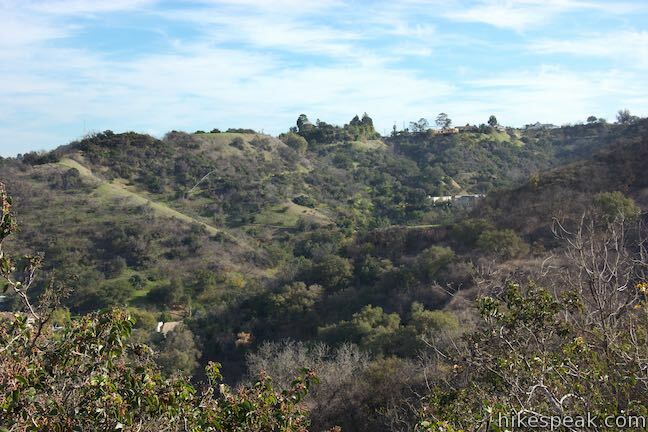 Longridge Park is located on the north side of the Santa Monica Mountains in Sherman Oaks, between Dixie Canyon Park and Coldwater Canyon Park. 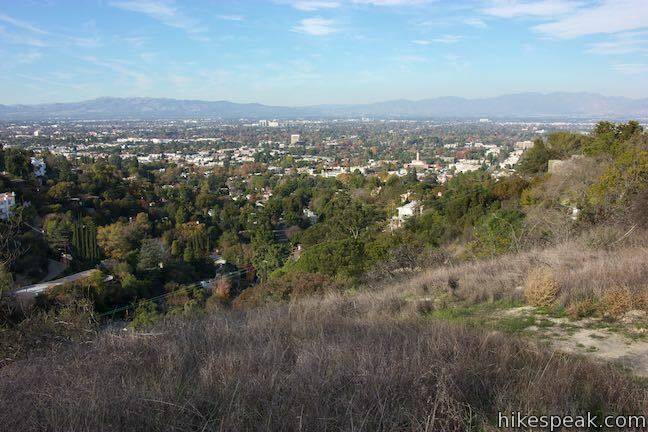 Use roadside parking and set out from the top of Alomar Drive (south of Ventura Boulevard and west of Coldwater Canyon Avenue). 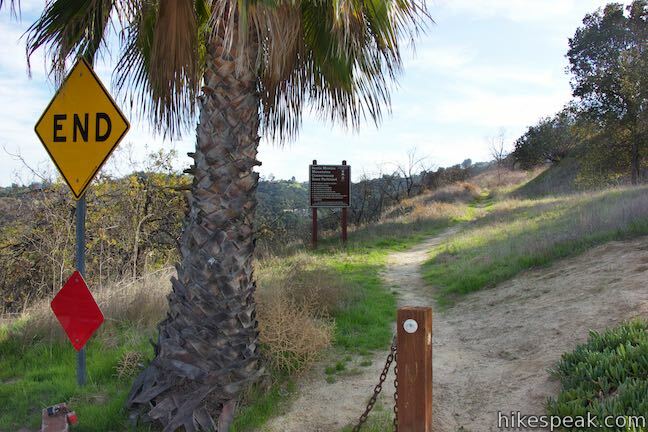 A dirt single track leaves from the end of the road, quickly passing a sign to announce that you are entering a Santa Monica Mountains Conservancy Zone Parkland. 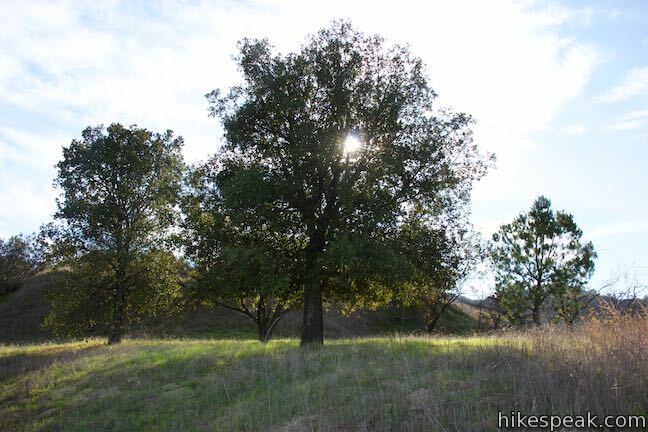 Begin up the trail, passing a cluster of live oaks on the right. 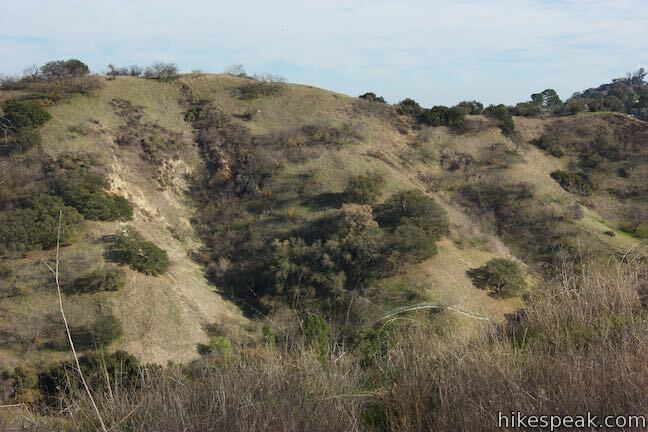 The trail quickly swings to the right, going up a rise on the ridge. 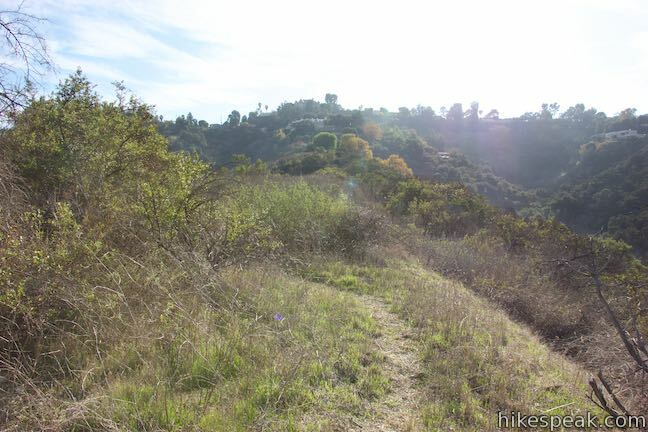 As the trail turns, it passes a narrow path on the left. 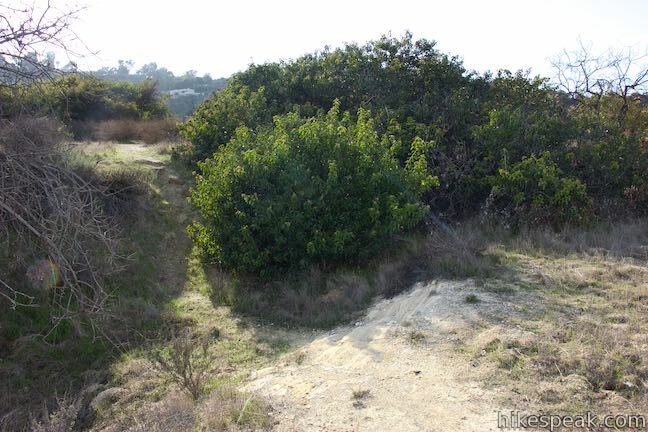 For those unopposed to scraping through the sagebrush, this path could be used to form a loop and explore farther in the park. 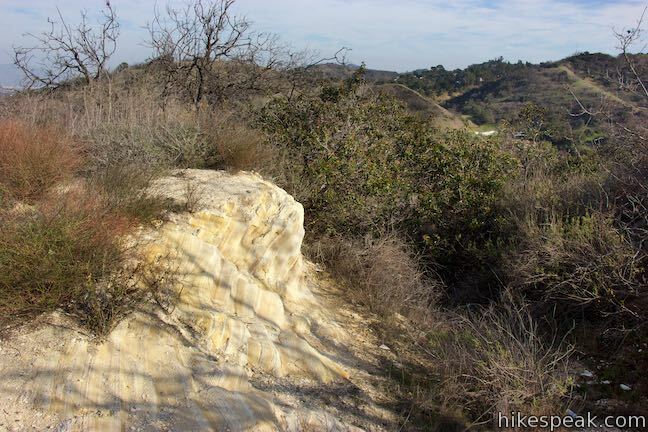 Continue up the trail onto the spine of the ridge, where it curves to the left past an excellent early viewpoint, a hundred yards from the start. 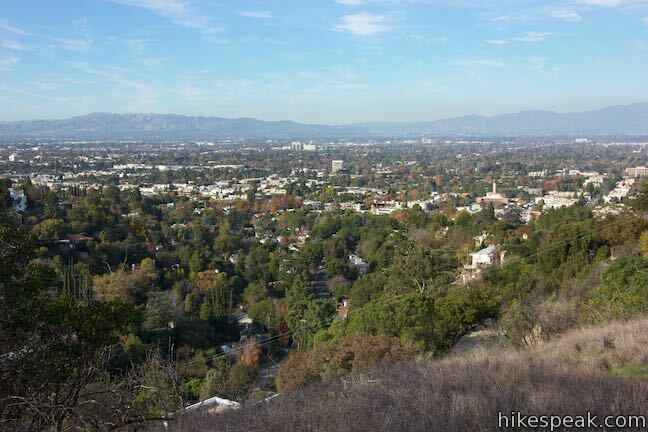 Pause to look west over Dixie Canyon and north across Sherman Oaks and other cities in the San Fernando Valley. 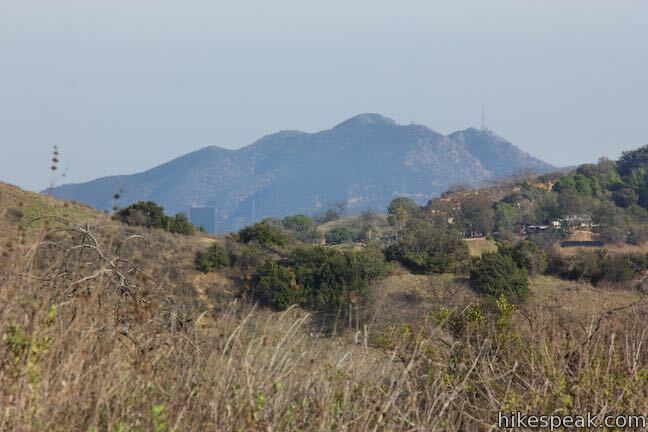 The Santa Susana Mountains and San Gabriel Mountains rise to the north. 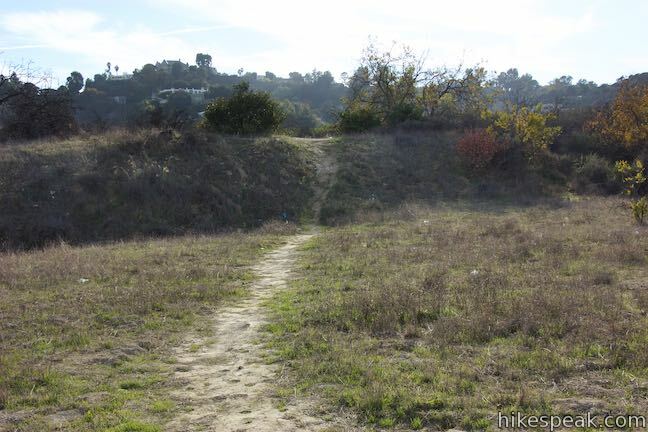 Longridge Trail ventures south up two leveled terraces in the ridge. After the second short but steep step in the terrain, cross a field and approach an unmarked junction in front of a shallow trough. 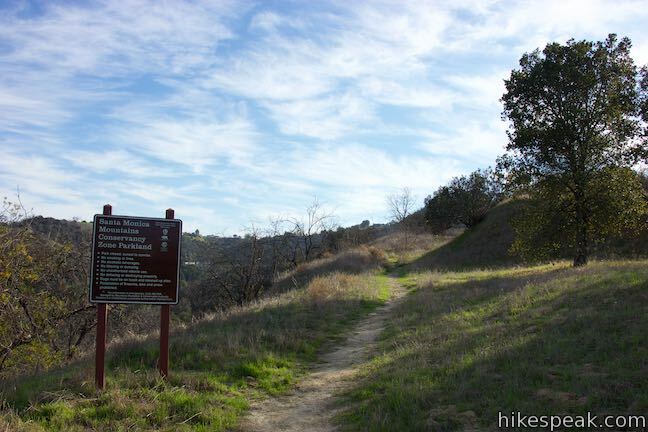 One branch of the trail goes to the right, snagging additional views over Dixie Canyon, while the other half of the trail goes straight ahead. 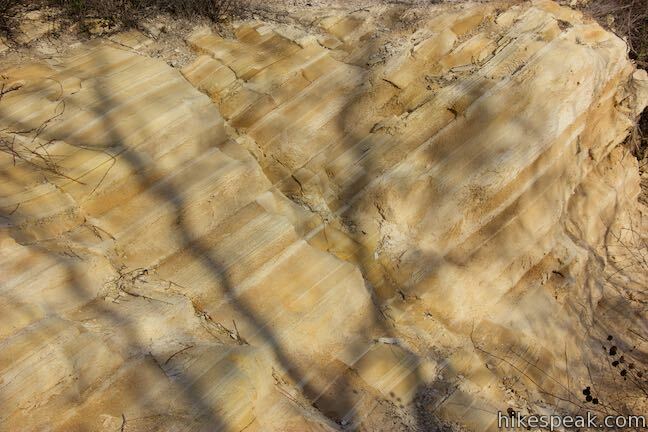 Proceed straight for a moment and then look underfoot and off the left side of the trail to observe areas of exposed bedrock with stylish stripes. 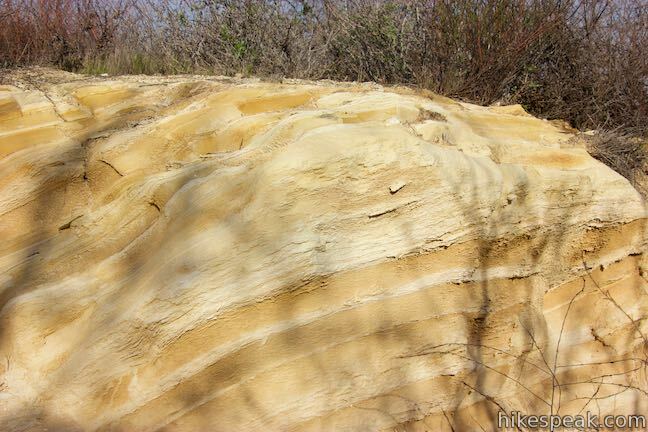 An upturned crest in the bedrock reveals sandstone that is layered in different shades of yellow and tan. While this is no Fire Wave, it’s certainly a fun feature. 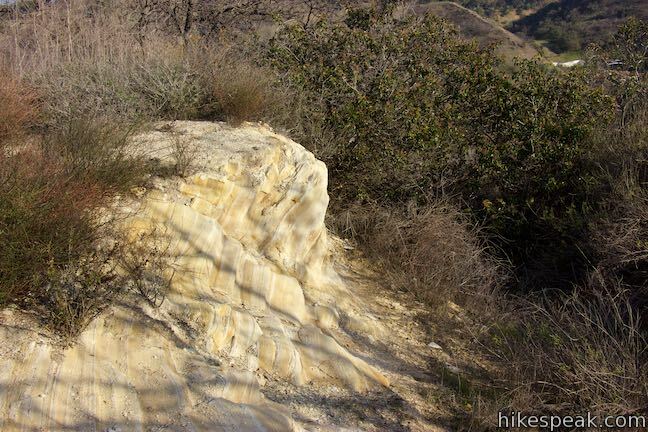 Leave the outcropping, 1/8 of a mile from the start, and continue up either branch of Longridge Trail (they quickly reunite). 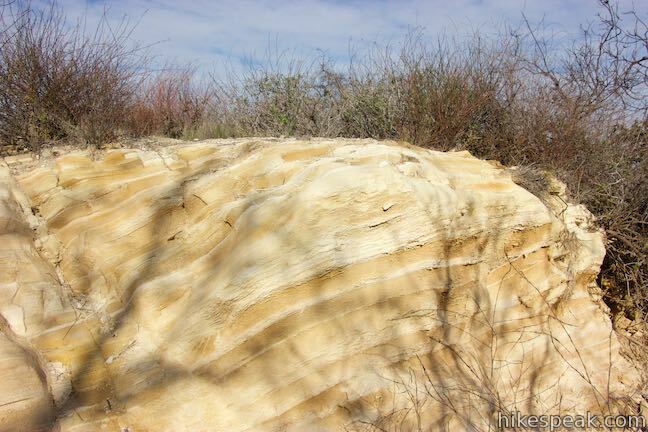 Come to another small clearing where the trail seems to splinter and end. Don’t despair. 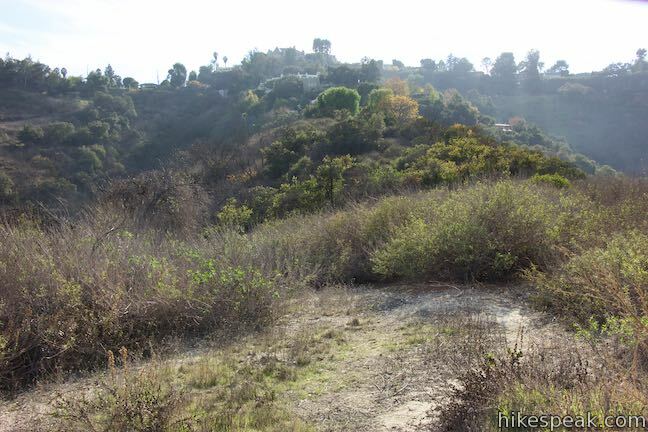 Proceed up a thinner trail along the west side of the ridge top (keeping the taller brush to your left). 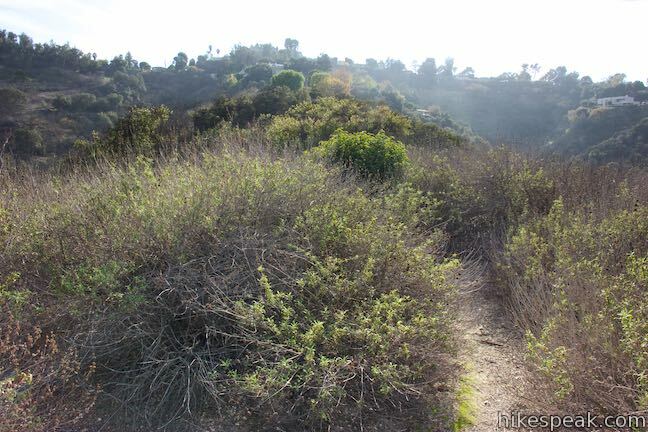 March through grasses, looking south up the ridge toward mansions along Mulholland Drive. 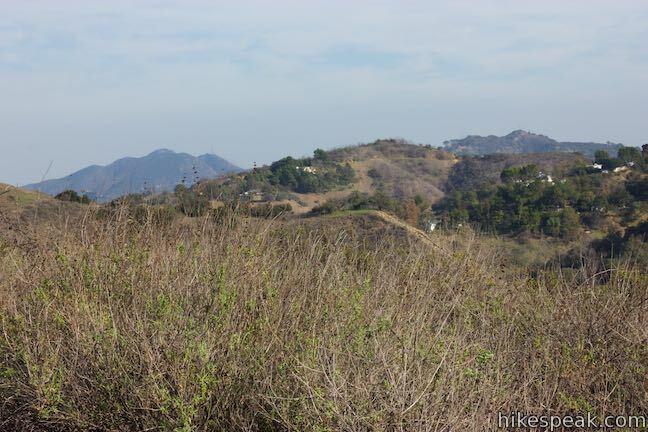 Approach a longer clearing, 0.2 miles from the start, which boasts nice views of the surrounding Santa Monica Mountains. 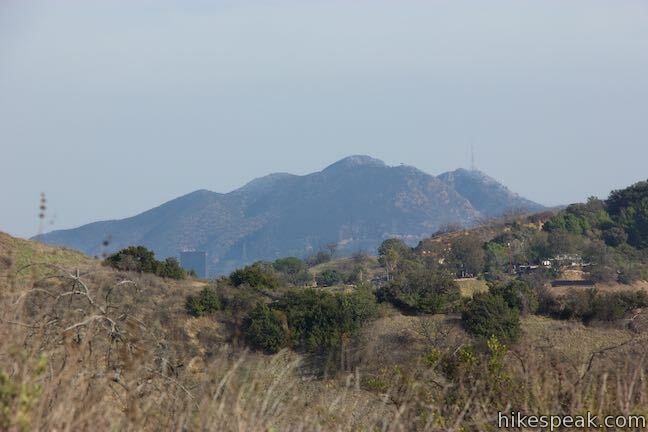 Look over a saddle in the ridge to the east to see the tops of Cahuenga Peak and Mount Lee in Griffith Park. To the south, the trail becomes even thinner and harder to trace as it runs into dense sagebrush. 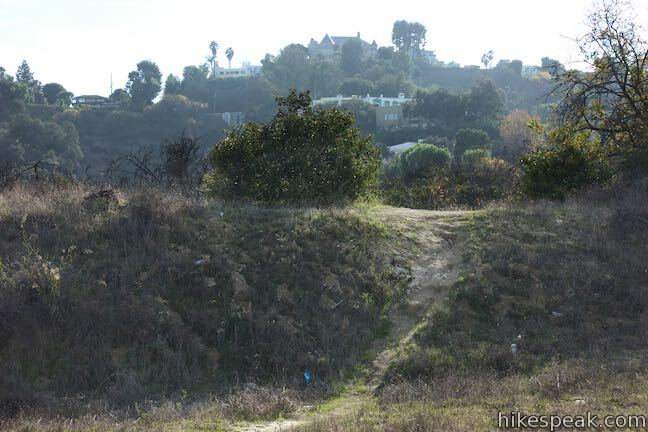 Unless you uncover an easy way to advance or dip below the east side of the ridge to loop back to the start (future trails may be developed in the park), it is probably best to turn around at the clearing with the Griffith Park views. 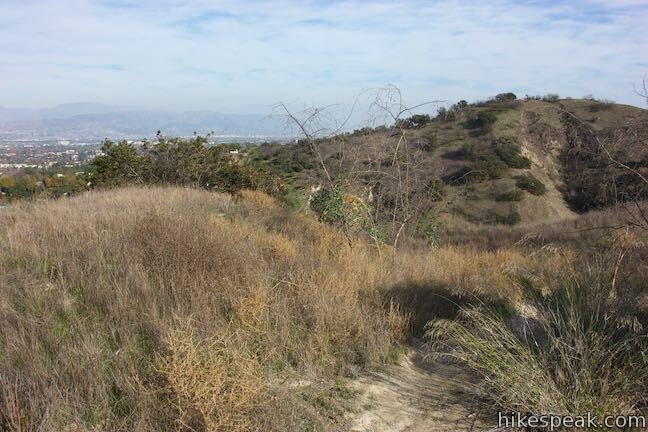 Although it might feel like you’ve just gotten going, this is the end of the trail! 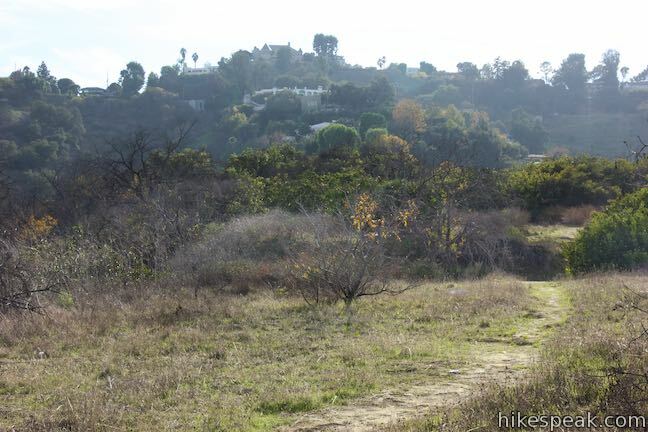 Turn around and hike back through Longridge Park. 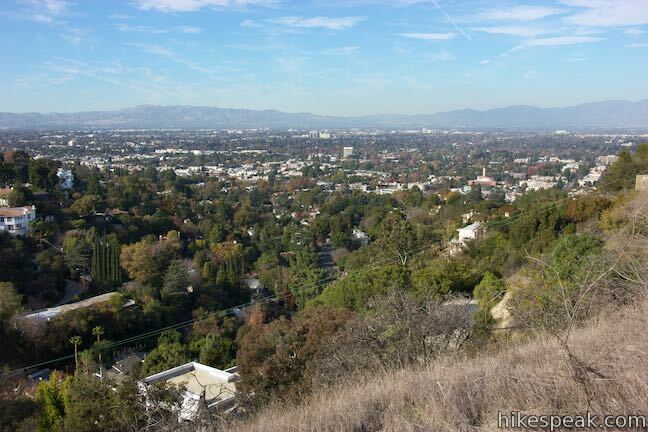 Ease down the ridge, enjoying broad views across the San Fernando Valley, and return to Alomar Drive. 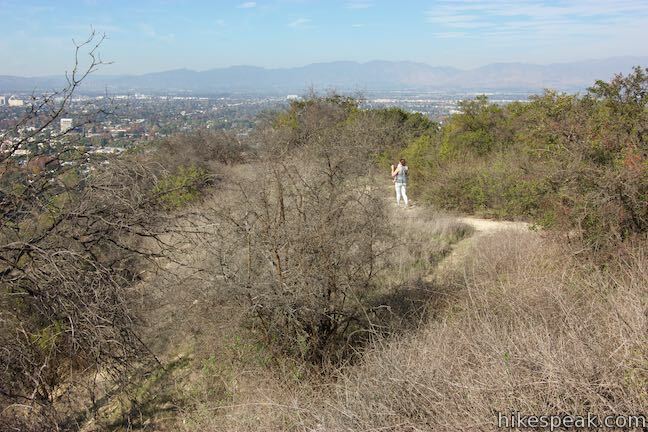 Longridge Park is operated by the Mountains Recreation and Conservation Authority. The park is open from sunrise to sunset. Dogs are permitted on leashes. Bikes also appear to be allowed. Please pack out all trash (far too much garbage has been dropped along the trail). 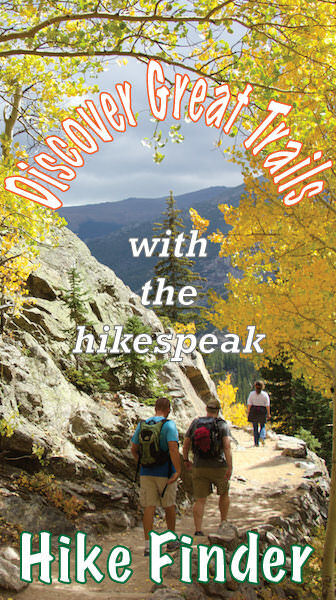 No fee or permit is required for this hike, so get out and enjoy. 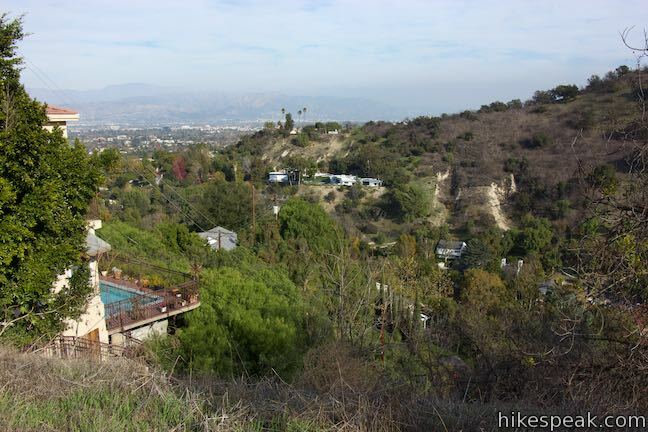 To get to the trailhead: Take the 101 Freeway to exit 15 for Coldwater Canyon. 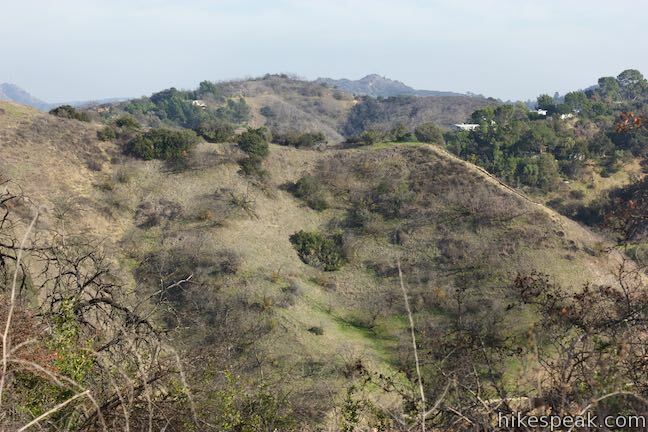 At the end of the offramp, turn south on Coldwater Canyon Avenue. 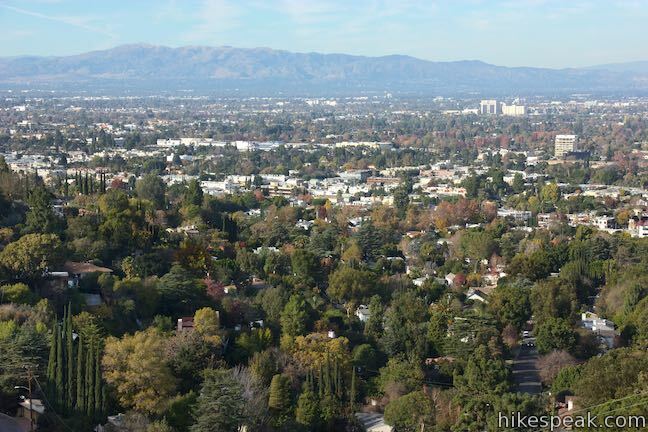 Drive 3/4 of a mile to Ventura Boulevard and turn right. 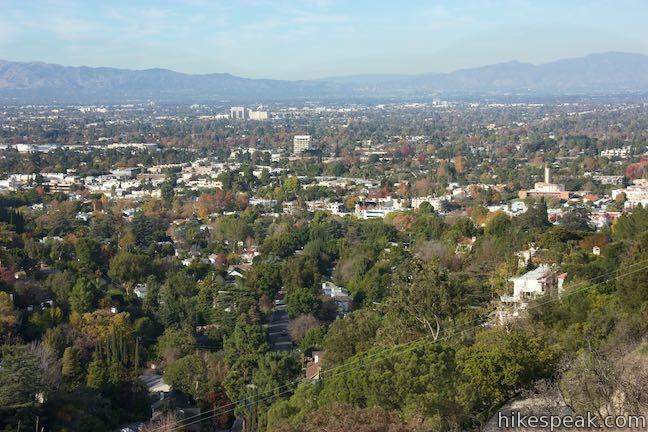 Drive one block and turn left onto Valley Vista Boulevard. Drive 0.2 miles and turn left up Mary Elle Avenue (the 4th left). Go one block, cross Longridge Avenue, and continue up Alomar Drive. 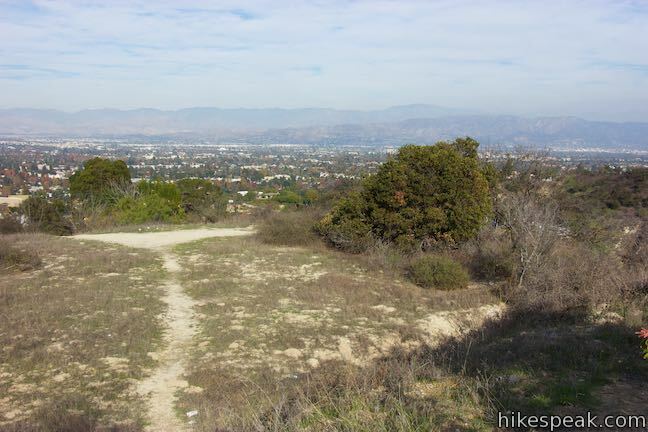 Make a left turn at an intersection with Cheltenham Drive to follow Alomar Drive for 0.6 miles up to the trailhead at road’s end. 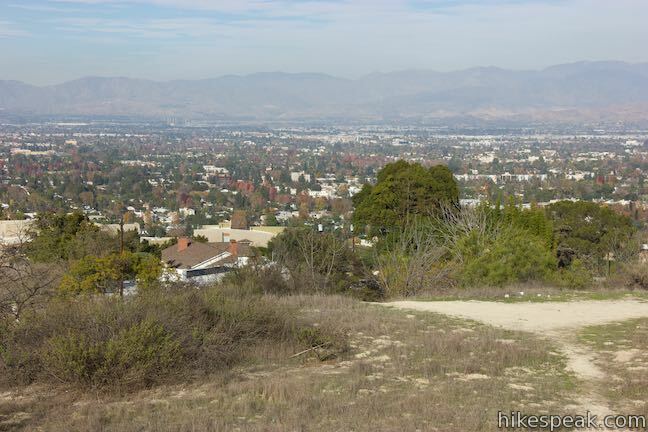 By mass transit, take either LA Metro bus line 150, 240, or 750 to the Ventura / Valley Vista stop along Ventura Boulevard. 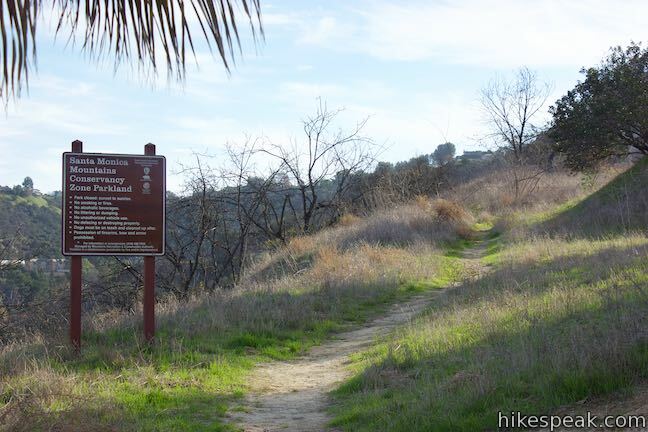 Walk a little under one mile from there up to the trailhead. 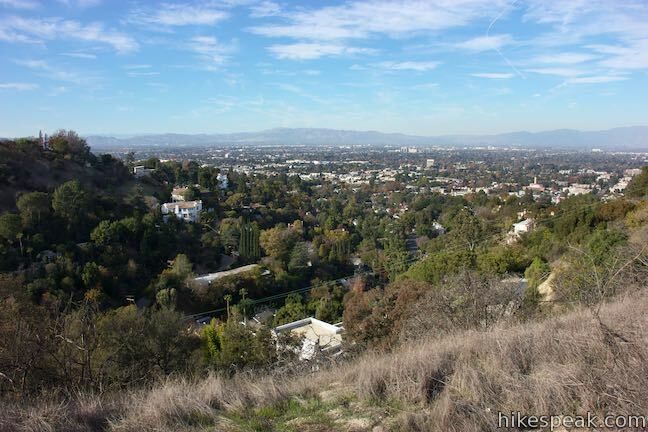 Tour Hollywood's most popular dog park on loops of various lengths that offer good exercise and views over Los Angeles.